-staying up past my bedtime to read Wendy Knits' Socks from the Toe Up and Cookie A. 's Sock Innovation. I can't put these two books down! I know that there is many a slip twixt the reading about socks and the making of them, but doesn't it seem like a good sign? -getting three golden oldie WIPs out and working on them in my spare time. This might be my greatest piece of evidence that the socks are back in the house! STR 'Spacedust' Monkeys, Malabrigo 'Violetas Africanas' Embossed Leaves, and Plain Ol' Sock in Kaffe Fassett 'Landscape Fire'. Neat, but not as impressive as the right side. Maybe that's why it's called the right side...Doing another photo shoot allowed Madame Older Sister to break out her best gray t-shirt and yellow capris for a grellow-tastic shawl how-down in the backyard. She's 14 now and has informed me that 'Tween Thing' is no longer an acceptable moniker...sigh. Mods: None, and I am proud to say that I didn't even make one mistake on it, either, which is a shawl first for me. 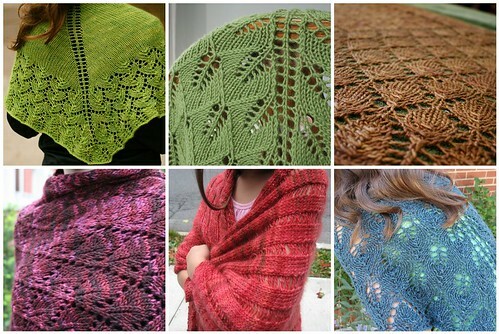 Earthchick has observed that I have made the transition from hat lady to shawl lady--and I think she might be correct. This one feels like it just flew off the needles. I have several more lots of Silky Malabrigo that will fit the bill and am thinking that the time is ripe to bust out another Evelyn C. pattern, one that I've made before and do cherish--the Shetland Triangle. 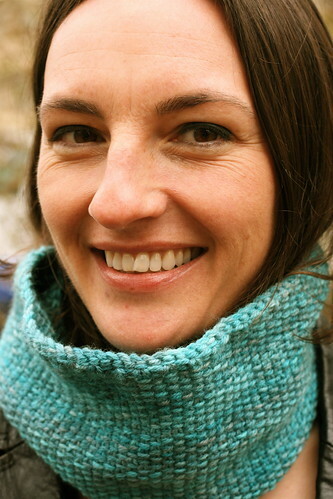 I believe that the cowl was sent to knitters the world over to provide us with the ability to make a hand knit gift for someone in under 36 hours during the work week. You know the time line I'm talking about: "....so-and-so cordially invites you to attend a party in honor of so-and-so in x amount of days". Naturally your mind races--do I have any recently finished hats to give? Umm, hello, it's supposedly April, not exactly hat weather. How about a Mason-Dixon Ball Band Dishcloth? Nice, but somewhat awkward. Happy Birthday! You can use this to clean up the puke after the party! No, the project must be special and fast--this is why the cowl exists, I'm sure of it. Yarn: Pagewood Farm St. Elias in 'Turquoise', two strands held together. Mods: I cast on 99 sts and it came out perfectly! I quite like the smaller stitches. Another winning pattern from our friend at TTL. This is for a friend/colleague who turned 50. Not the friend colleague you see pictured here--you might recognize her as my impossible stylish French pal Sandrine. I love her because of her photogenic ways and also her willingness to go along with whatever I propose. I send her a brief email in the morning "need you for a photo shoot" and she dutifully waits for me outside the classroom and helps me scout out a good location. She never complains and is a sooper trooper. Sadly the greenhouses were closed for spraying, so we made do with the parking lot. 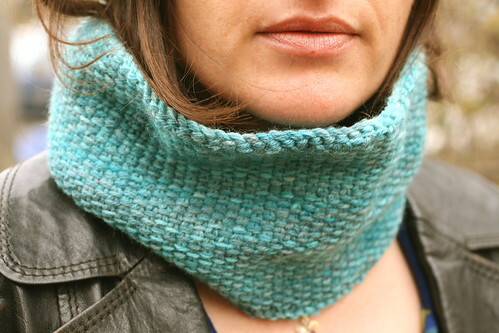 Those of you who guessed that I'd be working on the Acorn cowl were correct! I can't wait to get going on that, such a great pattern. We really are fortunate to be knitters at a time when so many awesome indie designers like Kirsten Kapur (SLOW DOWN I can't KEEP UP), Larissa Brown (Knitalong is a rad book that you MUST have), Pam from Flint Knits (attn: please don't make $$ of her FLS pattern, to do so is extreme douchery and will cause me to sick the Marxist Curmudgeon on you) and Kate (The Selbu Modern and Opus Spicatum made 2008 a better year for me and 2009 is looking up because of Springtime Bandit ) are working hard to keep us busy with interesting, creative patterns. Let's all do our best to respect their work and support them, ok? ...because I have a finished pair of socks ! Yes--me. Socks. A pair. How long has it been since I can lay claim to finishing a pair of socks? The wayback knitting machine of Ravelry tells me that it has been since August. Like, before-Obama-got-the-nomination August. These are the TTL Mystery socks, and I am so happy that they are done. Moving them into the done column is providing me with a sense of accomplishment, which in my little Potemkin village of a life, is something. Mods: I did the plain pattern, w/o the cables. I think sport weight might be the way for me to go in all things socks. Doing them on a size 2 needle is deeply gratifying as they do tend to go much faster. I was about to write 'fly off the needles' and then I restrained myself, because, umm, hello? I did start these in October. I am glad that I followed the suggestions of those who recommended doing both at the same time.Whew! 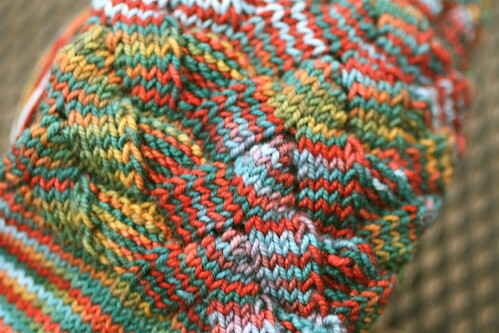 The appeal of the MadTosh yarn is that it is so darn durable. No splitting, very sturdy and the colors are stupendous. Count me in as a fan. Not that my sock yarn purchases would be any indication of my sock stagnation--no worries, although it has slowed down, it is still managing to find its way into my ever-loving stash. 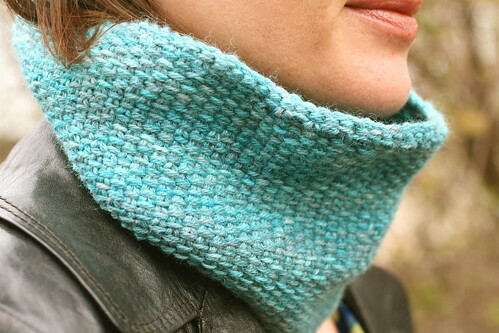 Next up for me are two cowls: one for a colleague and another that is quite 'nutty'--can you guess what it is? I seem to have succumbed to the lure of the shawl. I have found myself mostly buying shawl quantities of yarn and the sole Ravelry patterns that make my heart go humpa-pumpa are tagged with 'shawl', and 'wrap'. This is quite hilarious to me as when it comes to wearing a shawl, I have absolutely no idea how it is best done. I can't even imagine it. Sometimes when I see a pattern, I envision myself wrapped in a shawl as I lead students through a difficult yet enlightening reading of Rimbaud while grasping a hot cup of tea for warmth. This vision usually gives way to the recognition that during class I tend to be covered in chalk, many students didn't do the reading and are therefore texting and not into the whole close reading thing, and that I'm more of a vending machine coffee person anyway (DON'T JUDGE there's a secret machine on campus that makes coffee that tastes like European train coffee). Next comes the unfortunate realization that the shawl would most likely be there to cover up the lunch stains on the front shelf rather than to shield me from the draft . 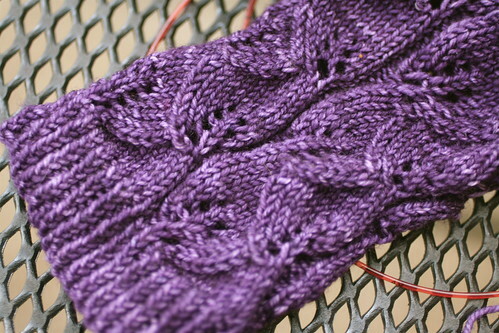 Alas...I still love knitting the shawl as it is the most gratifying of knits. After blocking it you find yourself marveling at it, the same way that a non-knitter would. "Gee, I really made that...". And no hand knit gift is more warmly received. Right now I have two on the go that are at various stages of completion. 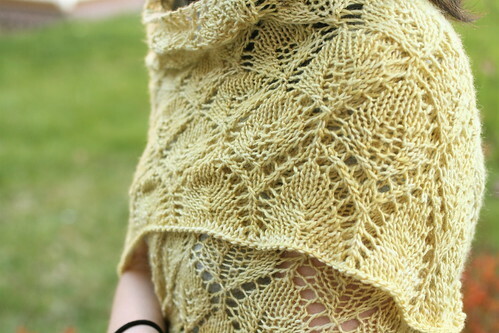 I began the Leaf Lace Shawl a little over a month ago thinking that I'd wear it for Easter. Ha! Today I realized that Easter was a week from today...but won't this be great for Memorial Day? I'm doing it out of some Silky Malabrigo 'Narciso' on size 9s and I sort of wish I would have gone down a needle size as the 9s feel gigantic in my hands, but I have made it this far and am not about to rip it out. This pattern is one of the most intuitive patterns ever--at any given time, you just know right where you are, and I like that. This weekend I was casting about for more patterns to start and thus began Icarus, i.e., the shawl that has tested the patience of many. I am attracted to it because à la Ishbel, the first 40 hours or so are spent on a giant, fairly plain almost-as-mindless-as-stockinette section. I figure once I hit the pattern section, tedium will have fried my brain and I'll be ready for something new. I chose two skeins of Jitterbug 'Whirly Fig' that had been languishing in the stash for a while. I'm not putting an end date on this one, but since my Labor Day is wide open, why not spend it blocking a shawl?